Typical Contrast Enhanced Images Obtained by MRI in a Short - AxisView (Upper panels) and a Long Axis View (Lower Panels) in Three Patients. 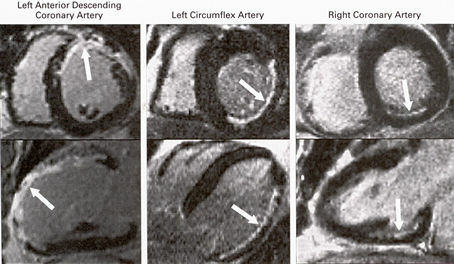 Hyperenhancement is present (arrows) in various coronary - perfusion territories - the left anterior descending coronary artery, the left circumflex artery, and the right coronary artery - with a range of transmural involvement. Reference:R.Kim and others.The New England Journal of Medicine,Vol.343,Nov.16,2000,No.20,Pp.1445-1453.